"blasts us into total submission"
Hello Possums! 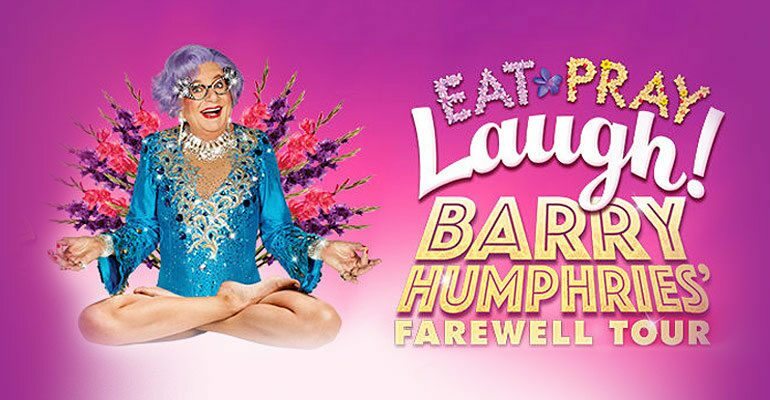 Barry Humphries brings his most colourful and most loved creation Dame Edna Everage back to London's home of family entertainment. Following a successful tour in Australia and New Zealand, this brand new show is described as "all-singing-all dancing", and will have you in stitches as the Tony Award winner discusses a wide range of topics, from to gender, climate change and ethnicity, to gay marriage. Bought tickets to see Barry Humphries for my wife michelle for her birthday and was worth every penny a laugh a minute show thats will have you falling about with laughter from Les patterson to dame edna, two and a half hours of pure entertainment both myself and my wife were invited on stage by les patterson and experience we will never forget it's just a shame we didn't get any photo of the event must try and get mr humphries to sign my programme before the end of his run at the Palladium. 5 stars every time from us big thank you. Comic genius at his very best. Very, very funny and non- PC. Thought he was spectacular, highly recommend. Hard to believe he is 79 when he seems so lithe and nimble as Dame Edna.